Ace Metal Spinning continues to deliver what it is known for in the spinning industry - superiority. We have developed and maintained business relationships for over 65 years. Through these years, Ace has progressed with current technology and maintains up-to-date, state-of-the-art equipment in the metal spinning industry. 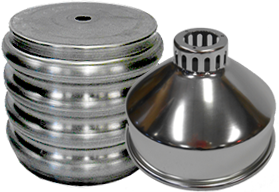 We produce components for many industries: lighting, ventilation, safety products, air filtration, farming, transportation, musical, construction, food, electrical, fire prevention, heavy equipment, and more. Site created by Thomas Web Solutions© 2018, Ace Metal Spinning, Inc.